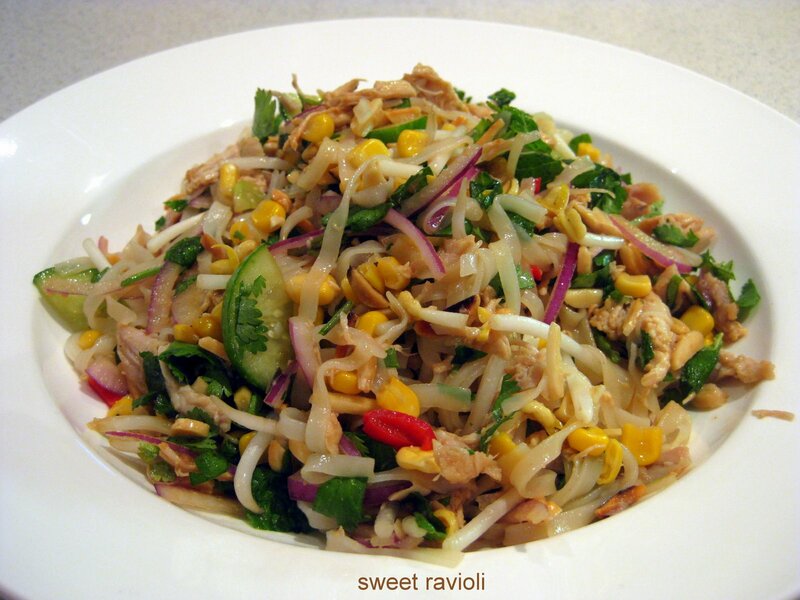 Chicken Noodle Salad | sweet ravioli! My husband spotted this colourful salad in one of my food magazines and we both agreed we had to try it. The flavours are fresh and fragrant, thanks to the coriander and mint, and the nuts, onion and capsicum give a nice crunch. Its a great way to use up some leftover barbecued chicken (and very healthy and low-fat too). If you are not a fan of fish sauce, I would urge you to not omit it from this recipe. At only one tablespoon you will hardly taste it – it just gives the dish a nice salty base which enhances the contrasting flavours. This is a great salad to take to a BBQ or lunch! Adapted from Recipes Plus magazine. Prepare noodles as per packet directions; place in a large bowl, ensuring strands are separated. Add all other ingredients and mix well. Combine dressing and pour over salad. At this point I recommend storing the salad in the fridge for at least 30 minutes in order for the flavours to develop. Its a good idea to toss the salad once during resting time, as the dressing will seep to the bottom of the bowl.